Abhyanga: Single masseur massage of the body whose therapeutic benefits include improved blood circulation and skin lustre; combats sleeplessness and fatigue. Akshitarpana (Eye Treatment): Medicated oil or ghee is kept over the eye within a herbal paste boundary. This treatment improves the eyesight and strengthens both the internal and external ocular muscles. Greeva Vasti: This form of external basti particularly benefits muscle spasm, rigidity and tension of muscles. It also strengthens the bone tissue. Khati Vasti: Specially prepared warm medicated oil is kept over the lower back within a herbal paste boundary. Effective for back pain and spinal disorders. Nasya: Nasal administration of medicines affecting head, neck and chest disorders such as certain types of headaches, paralysis, mental disorders, some types of skin disease. Dietary restrictions ensure this treatment is fully effective. Pichu: Treatment whereby oil is retained over the affected site by an oil-soaked cotton sheath. Usually of 20 minutes duration. Effective for muscle spasm; muscle or joint pains / tension; rigidity of muscles or joints. Shiro Vasti: Keeping medicated oil or paste on the head with the aid of a special cap. Particularly effective for headaches, migraine, mental stress and insomnia, dryness of nostrils, mouth & throat. 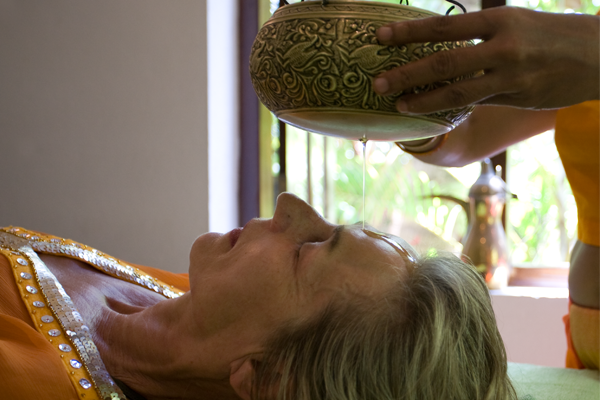 Shirodhara: Warm oil poured in a continuous flow to the forehead. Indicated for headaches, sleeping problems, depression, loss of memory, mental tension. Snehanam (internal oleation): Preparation for virechena, whereby sesame oil / ghee (or other) is taken orally over a number of days to prepare for purgation. Without this preparation, virechena cannot be complete and might even result in complications for the patient. Synchro Massage: Body massage by 02 people in simultaneous movement and pressure. Synchro-massage has similar therapeutic benefits as abhyanga. Uro-Vasti: Specially prepared warm medicated oil is kept over the anterior chest area within a herbal paste boundary. Effective for bronchial asthma and other respiratory tract diseases. Vamana: Therapeutic vomiting whereby toxic substances are removed from the stomach. Indicated for bronchial asthma, sinusitis and skin diseases. Vasti / Basti: Medicated enema centred on the large intestine and vata disorders. At Surya Lanka, this treatment is administered by doctors only and is indicated for arthritis, gastric complaints, rheumatism and chronic constipation. Virechana: Preceded by snehanam (internal oleation) plus oil and steam, this is medicine induced purgation, centred on the small intestines, affecting pitta disorders. This treatment is supported by a special diet.